Assam government has announced 19 cancer care centers to be set up across the state in partnership with Tata Trusts at an investment of Rs. 1,910 crore by mid-2020. The Assam Government and Tata Trusts have formed a non-profitable entity, Assam Cancer Care Foundation with equal partnership to implement the project and manage the centres. The Gauhati Medical College and Hospital (GMCH) was linked with cancer hospitals of the Tatas in Mumbai and Kolkata, enabling doctors here to consult their counterparts in the two cities. 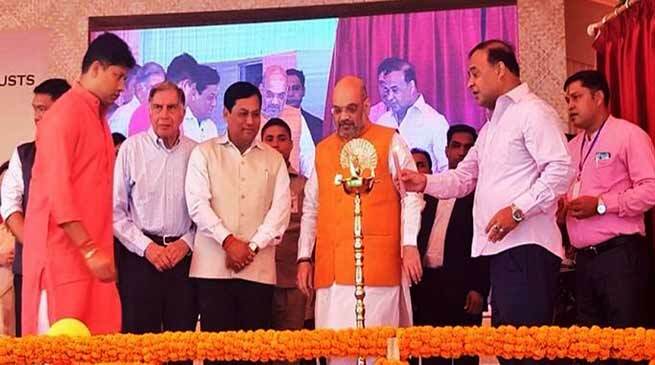 Tata Trusts Chairman Ratan Tata and Assam Health Minister Himanta Biswa Sarma rolled out a platform, ‘Digital Nerve Centre (DiNC)’, to connect cancer care unit of the GMCH with the two other hospitals. The two hospitals are Tata Memorial Centre in Mumbai and Tata Medical Centre, Kolkata. “With launching of this platform, our doctors will be able to discuss cases of patients with those from the Tata hospitals in Mumbai and Kolkata. In many cases, patients will no longer require to travel outside Assam,” Sarma told a press conference after launching the project. Sarma said that ” Assam Cancer Care is path breaking and I sincerely hope it will serve the needy and bring about a paradigm shift in cancer care in the Northeast region. The 3-layered facilities are scientifically designed and will ensure massive focus on awareness, prevention and early detection”. The state government and Tata Trusts have proposed to develop 19 cancer care centres across the state and those centres would also be connected to this platform, he added. The Assam government is also setting up a 500-bed cancer hospital under the GMCH and it will be the apex centre for cancer treatment, he further added. For this, the government is investing Rs 200 crore, of which Rs 180 crore would be given by the Centre, he said adding that this hospital will be known as South East Asian Cancer Research Centre. “Patients’ record keeping and consultation will be a seamless affair with this technology. It is developed by the TCS and the Tata Trusts has given it to us free of cost. Assam is the first greenfield project for DiNC,” Sarma said. The platform has the potential to connect all the 143 cancer care hospitals under National Cancer Grid in future, the minister said. South-East Asia Cancer Research Institute will be set up at Cancer Hospital, GMCH, Guwahati. Level One facility at AMCH, Dibrugarh will be established with advanced treatment and education facilities. Twelve Level 2 centres with comprehensive oncology services including palliative care facilities next to Government medical colleges in Barpeta, Dhubri, Jorhat, Karimganj, Kokrajhar, Lakhimpur, Nagaon, Nalbari, Silchar, Tezpur and Tinsukia. Five Level 3 centres with screening, diagnostic and day-care services will come up adjacent to District Hospitals at Daring, Goalpara, Golaghat, Haflong and Sivsagar.